It somehow seems we have reached a point where alfalfa is often defined as "Roundup Ready" or not; to be sure, glyphosate resistance is a nice tool that expands some management options, specifically weed control. 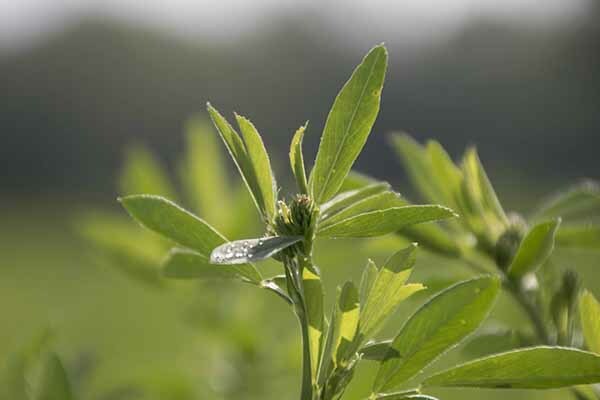 There is, however, more — a lot more — to defining or choosing an alfalfa variety. In fact, I've always said choosing an alfalfa variety based on one trait is like picking your spouse only because he or she has blonde hair. There could be some additional baggage there that is not so desirable. And so it is with alfalfa varieties. Just as it's unfair to define an alfalfa variety by a single trait, it's equally unfair not to recognize some of the other important trait changes that have occurred to the species, though not in quite so an immediate or dramatic fashion as glyphosate resistance. Certainly, there have been improvements in disease and stress resistance. 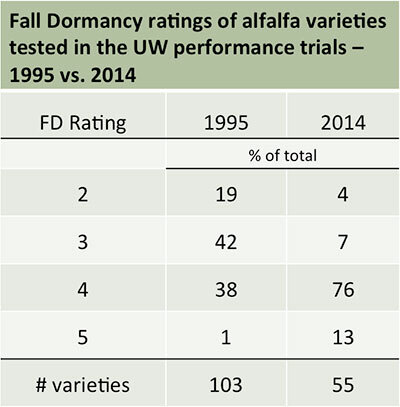 Also of interest is the change in fall dormancy (FD) ratings among the dormant varieties being marketed. In University of Wisconsin alfalfa variety trials in 1995, 61 percent of the tested varieties were FD 2 or 3 (see table). These varieties ruled the day because they excelled in winter survival and/or persistence; however, it was usually at the expense of yield. In 2014, FD 2 and 3 varieties comprised only 11 percent of UW-tested varieties; the faster growing FD 4 or 5 varieties accounted for the remaining 89 percent. The shift in FD rating among offered varieties may not mean a whole lot to many alfalfa growers, but what is important is the break between the FD rating and winter survival/persistence relationship. The extreme alfalfa winterkill years of the early 1990s in the upper Midwest shifted the focus of alfalfa breeding programs. Cultivar selections started to be made under intense cutting regimes, while still putting an emphasis on yield potential. Currently, some FD 4 and 5 varieties with fast regrowth and yield potential now also possess exceptional winter survival and persistence characteristics, providing a great dividend to growers. In the tables below, data provided by Mark McCaslin from Forage Genetics International is presented. It is interesting to note that some of today's FD 4 and 5 varieties have far better winter survival and persistence characteristics than the FD 2 and 3 varieties of years gone by. As we move through this era of "Roundup Ready" or not, it's important to realize that there is a performance range within each group. This will also be the case with new low lignin varieties. Alfalfa growers are well served to evaluate the complete package, even if it's among only those varieties with the one desired trait that is needed. Where possible, look for university or company performance data.